After dropping a mysterious and intriguing teaser, #AliaBhatt just shared the most touching and beautiful official poster of her forthcoming drama #Raazi on the social media. Alia Bhatt shared the poster on her Twitter account. She captioned it, “A daughter... #ShadesOfRaazi @meghnagulzar @karanjohar @vickykaushal09 @DharmaMovies @JungleePictures @vineetjaintimes @apoorvamehta18”. In the poster, Alia Bhatt is looking pretty as young bride and Rajit Kapur, who is playing her father in the film, is kissing her on the forehead, probably the most touching moment in every girl’s life. Raazi is directed by Meghna Gulzar and produced by Karan Johar's Dharma Productions and Junglee Pictures. The movie also stars Vicky Kaushal. Karan Johar also shared an emotional post with the poster. He wrote, “Strong, Emotional, Fiercely Independent. The kind of daughter everyone wants but i already have! @aliaa08 . #ShadesOfRaazi #Raazi @apoorvamehta18 @DharmaMovies and @JungleePictures @meghnagulzar @vickykaushal09”. 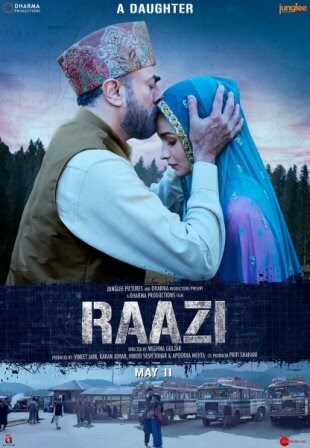 The storyline of Raazi is based on the best-selling book by Harinder Sikka titled Calling Sehmat. Alia's character, who is Kashmiri, is an Indian spy while being married to a Pakistani Army official, which is played by Vicky Kaushal.